Elise Phillips was born in Wayne, Pennsylvania into a family with an extensive background in the fine arts. Her great, great grandfather founded Newman Galleries in Philadelphia in 1865, and today she is the fifth generation of the family involved in the arts. A graduate of The Hussian School of Art in 1983, she was an accomplished illustrator and graphic designer with many successful commissions in the business community. With an inherent passion for painting, she enrolled at the Pennsylvania Academy of Fine Arts, emerging well schooled in the tradition of the Academy. 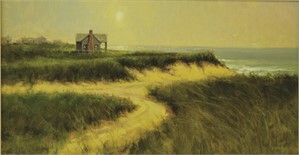 Elise has for many years maintained a studio in Elverson, Pennsylvania, where the bucolic countryside is a constant source of inspiration for many of her paintings, as is Martha's Vineyard, Nantucket, the Chesapeake Bay and the coast of Maine. An award winning exhibitor, she is a signature member of the Philadelphia Water Color Society, a member of the Philadelphia Sketch Club, Oil Painters of America, and the Mid Atlantic Plein Air Painters. Elise Phillips Elise Phillips was born in Wayne, Pennsylvania into a family with an extensive background in the fine arts. Her great, great grandfather founded Newman Galleries in Philadelphia in 1865, and today she is the fifth generation of the family involved in the arts. A graduate of The Hussian School of Art in 1983, she was an accomplished illustrator and graphic designer with many successful commissions in the business community. With an inherent passion for painting, she enrolled at the Pennsylvania Academy of Fine Arts, emerging well schooled in the tradition of the Academy. 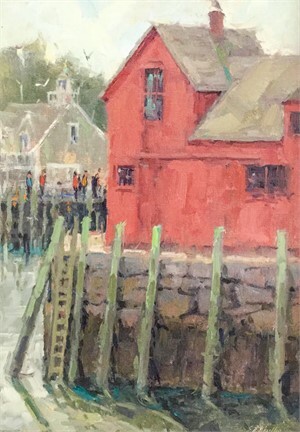 Elise has for many years maintained a studio in Elverson, Pennsylvania, where the bucolic countryside is a constant source of inspiration for many of her paintings, as is Martha's Vineyard, Nantucket, the Chesapeake Bay and the coast of Maine. An award winning exhibitor, she is a signature member of the Philadelphia Water Color Society, a member of the Philadelphia Sketch Club, Oil Painters of America, and the Mid Atlantic Plein Air Painters.